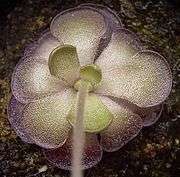 Pinguicula, commonly known as the butterworts, is a genus of carnivorous plants that use sticky, glandular leaves to lure, trap, and digest insects in order to supplement the poor mineral nutrition they obtain from the environment. 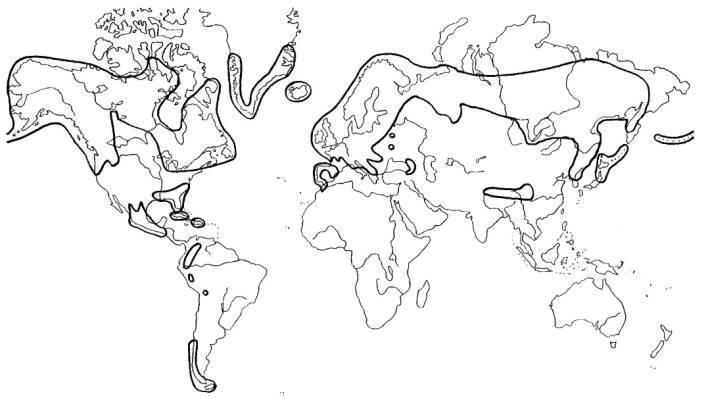 Of the roughly 80 currently known species, 12 are native to Europe, 9 to North America, and some in northern Asia. The largest number of species is in South and Central America. Like all members of the family Lentibulariaceae, butterworts are carnivorous. 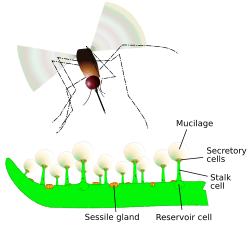 In order to catch and digest insects, the leaf of a butterwort uses two specialized glands which are scattered across the leaf surface (usually only on the upper surface, with the exception of P. gigantea and P. longifolia ssp. longifolia). One is termed a peduncular gland, and consists of a few secretory cells on top of a single stalk cell. These cells produce a mucilagenous secretion which forms visible droplets across the leaf surface. This wet appearance probably helps lure prey in search of water (a similar phenomenon is observed in the sundews). The droplets secrete limited amounts of digestive enzymes, and serve mainly to entrap insects. On contact with an insect, the peduncular glands release additional mucilage from special reservoir cells located at the base of their stalks. The insect will begin to struggle, triggering more glands and encasing itself in mucilage. Some species can bend their leaf edges slightly by thigmotropism, bringing additional glands into contact with the trapped insect. 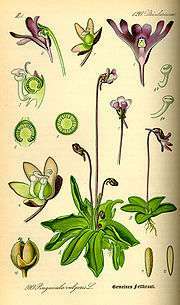 The second type of gland found on butterwort leaves are sessile glands which lie flat on the leaf surface. Once the prey is entrapped by the peduncular glands and digestion begins, the initial flow of nitrogen triggers enzyme release by the sessile glands. These enzymes, which include amylase, esterase, phosphatase, protease, and ribonuclease break down the digestible components of the insect body. These fluids are then absorbed back into the leaf surface through cuticular holes, leaving only the chitin exoskeleton of the larger insects on the leaf surface. The first mention of butterworts in botanical literature is an entry entitled Zitroch chrawt oder smalz chrawt ("lard herb") by Vitus Auslasser in his 1479 work on medicinal herbs entitled Macer de Herbarium. The name Zittrochkraut is still used for butterworts in Tirol, Austria. It was only in the late 19th century that the carnivory of this genus began to be studied in detail. In a letter to Asa Gray dated June 3, 1874, Charles Darwin mentioned his early observations of the butterwort's digestive process and insectivorous nature. (See Gray Herbarium of Harvard University (103). Darwin studied these plants extensively. S. J. Casper's large 1966 monograph of the genus included 46 species, a number which has almost doubled since then. Many exciting discoveries have been made in recent years, especially in Mexico. 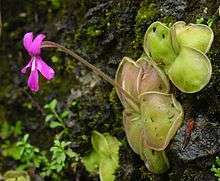 Another important development in the history of butterworts is the formation of the International Pinguicula Study Group, an organization dedicated to furthering the knowledge of this genus and promoting its popularity in cultivation, in the 1990s. 1 2 Cieslak T, Polepalli JS, White A, Müller K, Borsch T, Barthlott W, Steiger J, Marchant A, Legendre L (2005). "Phylogenetic analysis of Pinguicula (Lentibulariaceae): chloroplast DNA sequences and morphology support several geographically distinct radiations". American Journal of Botany. 92 (10): 1723–1736. doi:10.3732/ajb.92.10.1723. 1 2 3 4 Legendre L (2002). 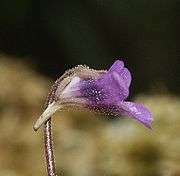 "The genus Pinguicula L. (Lentibulariaceae): an overview". Acta Botanica Gallica. 141 (1): 77–95. ↑ Keddy, P.A., L. Smith, D.R. Campbell, M. Clark and G. Montz. 2006. Patterns of herbaceous plant diversity in southeastern Louisiana pine savannas. Applied Vegetation Science 9:17-26. ↑ Keddy, P.A. 2010. Wetland Ecology: Principles and Conservation (2nd edition). Cambridge University Press, Cambridge, UK. Chapter 5. ↑ Darwin C (1875). Insectivorous plants. London: John Murray. ISBN 1-4102-0174-0. 1 2 Casper SJ (1966). Monographie der Gattung Pinguicula L. (Heft 127/128, Vol 31). Stuttgart: Bibliotheca Botanica. ↑ D'Amato P (1988). The Savage Garden: Cultivating Carnivorous Plants. Ten Speed Press. ISBN 0-89815-915-6. ↑ "From local food to terroir product ? - Some views about tjukkmjølk, the traditional thick sour milk from Røros, Norway". 2005-05-04. Retrieved 2008-09-04.